The next generation of contact lenses may allow you read emails, text messages or browse the web directly in your field of vision. A team of researchers, comprising scientists and engineers from the US and Finland, have developed the first bionic contact lens with a display device built in, potentially allowing messages and data to be projected in front of the user. The prototype lenses were built with just one pixel embedded and powered by a wireless battery 1cm away from the lenses but show that there is potential in exploring the concept further. 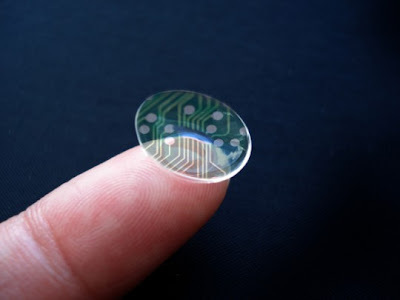 The potential uses of such contact lenses could be in messaging, gaming, navigation or they could be linked to sensors on the body, supplying real-time updates of health data like blood-glucose levels, heart rate etc. The scientists embedded a tiny LED with sapphire into the centre of a plastic contact lens. They then laid a circular antenna around the circumference of the lens and connected it with a circuit to the LED. Using remote radio frequency transmission, the scientists could control the pixel. The lens was made with a hard plastic that doesn't allow air flow to the eye, so would be unsuitable for human use in its current form. In addition there are problems with power generation, with the wireless battery having a range of just one centimetre. But the scientists have overcome other problems. The lenses, when tested on rabbits, didn't cause any abrasions, thermal burning or other potential negative effects on the eyes. The scientists also overcame issues surrounding focussing on images so close to the eye. Using an additional embedded lens, they were able to project the images directly on to the retina, which would allow humans see the images clearly. The results of the study were published in the Journal of Micromechanics and Microengineering.